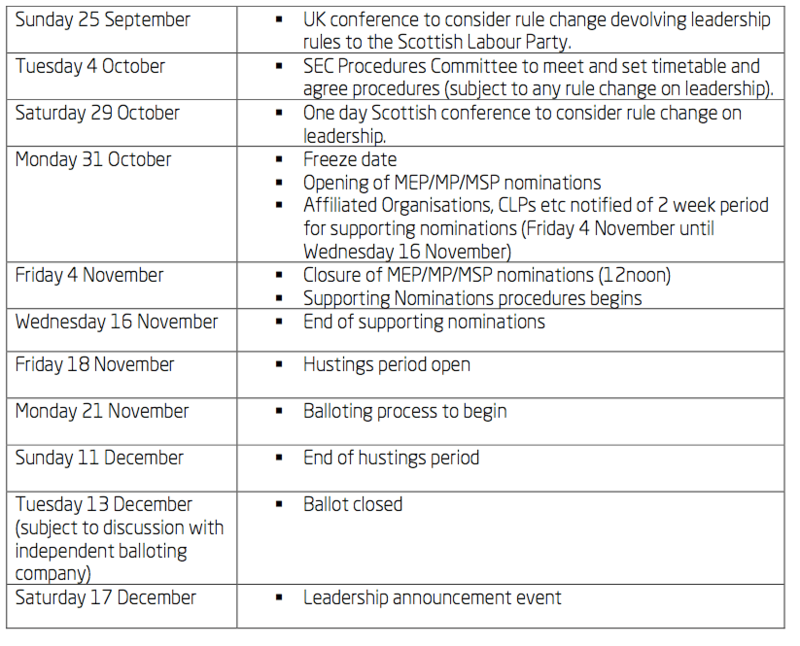 The Procedures Committee of the Scottish Executive Committee has produced a draft timetable for the election of our new leader. I smell stitch-up. What kind of balloting takes place BEFORE the candidates have a chance to put their case? 6 weeks between the end of nominations and hustings and 3 days between hustings and ballots? Too right. Beggars belief, doesn’t it? I think this looks totally disrespectful to candidates and voters alike. Wouldn’t it be supreme irony if Tom Harris, one of the most vocal opponents of AV, were to win this leadership election, which I gather is being held under a form of the very system he opposes? The Procedures Committee knows what it is doing. I see no cause for panic. Thursday 10 June: Deadline of acceptance of nomination by nominated candidates. Supporting nominations open. Monday 26th July: Close of supporting nominations. 12.30pm Wednesday 8th September: Freeze date for new members to join. It would appear that Scottish Labour have gone back to the Victorian era in electing a leader. I understand there is a desire to get the new leader in place ASAP, but surely it is better to give a little extra time so that we can a) end up with the best possible leader and b) all members and affiliates will feel they can support the leader, after hearign all the candidates in hustings, etc. Anything else might make some people feel the new leader lacks legitimacy. Last week I was wondering if my presence at the one day conference is a good use of my time, would I get the opportunity to get to the platform and if I did would my contribution be so brilliant that it would change the direction the party seems to moving towards. The answer was actually so easy NO. The consultation and the forthcoming leadership elections have certainly not filled me with enthusiasm. What we require is a more deep rooted revue of the Labour Party in Scotland. What do we believe in , what can we offer the Scottish people, certainly not what we offered before, and certainly not a Blarite agenda. We need to prove to the people of Scotland we are able to govern without the interference of the UK party. Let’s us get it right now and avoid another leadership debacle where we may end up having another leadership election in two years time. Interesting – Should “None of the above” be on the ballot? Let’s be honest about this whole leadership debate, none of the current names being mentioned are up to the job, our best MSPs left to go to Westminster, we were left with, exception of a few, third rate politicians. If I was to ask anyone in The East Of Scotland who are they, there is more chance that they would know the current X Factor contestants. As a party activist for over 30 years I think we, the loyal party members deserve better. I am sure that there are many who feel likewise,the party let us down in May’s election,we did not let the party down. It looks like that Ed Miliband has already picked a de-facto Scottish Labour leader. Shadow Scottish Secretary Margaret Curran has been selected to lead ‘Team Scotland’. What now for Tom Harris, Ken Macintosh and Johann Lamont? How can they be captain of the team when they are not even on the substitutes’ bench! Nice photo in Daily Recird today. While I would agree that there are some good people there, the timing is beyond me, I feel like its time to just give up, sit back and hope that Scotland cheer me up tonight. It would appear that Ed Miliband has deliberately undermined the Scottish Labour leadership election in setting up ‘Team Scotland’ with Margaret Curran as team leader. Team Scotland is set to increase it’s membership and rule. Any elected Scottish Labour leader will now be seen by many in the party as being a puppet. How many in the party saw this coming? Yet again the Scottish Party is being undermined, this website over the past few months has demonstrated that activists want change, this decision only goes further to demonstrate how out of touch the party is. I’m afraid this entire election has been extended beyond its ‘sell-by date’. With all the publicity following Grays resignation, any further press and media coverage of this event will only disengage potential Labour supporters even more. A new leader should have been in place a week after the Holyrood elections, and not this circus that we are being subjected to. As you say a properly run election should have taken place by now for a Scottish Labour leader with properly constituted powers. Instead we have ‘Team Scotland’ appointed, based and run from London. The problem, as ever, is that it is still all about Labour and not about Scotland. Can anyone explain to me what is going on just now, Ian Davidson has declared himself as a candidate in the deputy leadership.